When the holiday season arrives, it seems like people begin decorating sooner each year. There are a few ideas that you can use for the outside of the home as well as the inside so that you can get in the Christmas spirit along with family and friends. Lights can bring a little dazzle to any area of the home. You can place them on the roof, around windows and along porch railings to make the outside look like a gingerbread house. If you want something a little more elegant, then use white lights with red bows. Decorating the inside of the home with lights is easy as well. Drape a set of white lights along a fireplace mantle, adorning it with bows or ribbons. A fun idea is to put colored lights over doorways, hanging a few ornaments so that they shimmer when you walk by them. If you want to steer clear of the random decorations, then consider using a theme. Candy canes are easy to use inside and outside of the home. The best thing about this theme is that you can use red and white decorations of any kind instead of only candy canes for the same effect. This is beautiful idea for the kitchen as you often find the smells of peppermint while baking during this time of the year. A centerpiece idea is a large vase filled with peppermint balls and marshmallows. Layer the items for a fun look. Ribbon candy in multiple colors also works for a decoration. 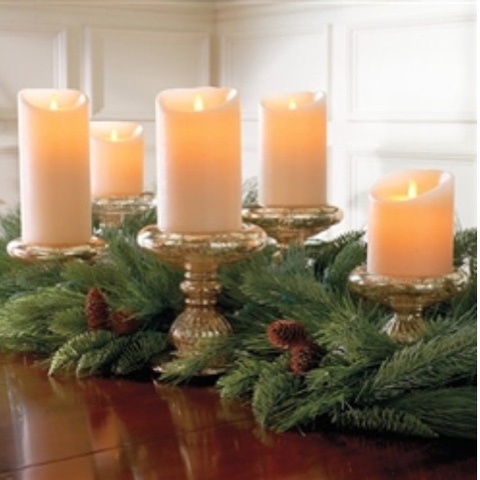 Or you can go for a more traditional centrepiece like these different height candlesticks and garland. Utilize the space above your head when decorating. Hang shimmering ornaments from a chandelier or fan. Dangle a ribbon in the shape of a bow in the center so that there is an accent piece. Light colors of blue and silver work well with this design. Create a modern look with tall glass vases that have a cylindrical shape. Place ornaments in the vases before putting them on a windowsill. The light from the sun will shine through the vase and the ornaments, creating a beautiful look on the floor and the furnishings in the room. There are sites online that suggest for you to Click here to look at pictures of completed projects.